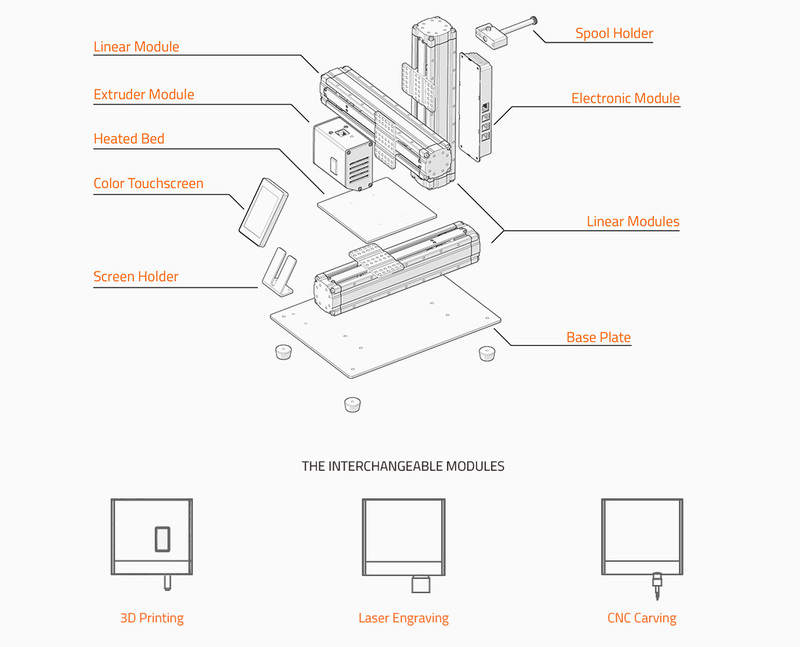 The device uses modular design to switch between 3D printing, CNC machining and laser engraving. What are you going to do with all that extra space on your workbench now? Thanks to its endless versatility and what the community around it has been able to pull off, we’re all still very much enamored by 3D printing. In the real world, though, subtractive manufacturing methods like CNC machining and the use of tools such as laser engravers is just as prevalent. Realizing that all three implements are based on a three-axis motion system, California startup Snapmaker created a 3D printer-CNC machine-laser engraver hybrid called, well, Snapmaker. The Kickstarter community seems to love the idea of a mashup and has made the product part of the million dollar club well before the close of the campaign. The secret behind Snapmaker’s ability to combine three of the most popular tools in the manufacturing and industrial design industries is a modular design. The machine makes use of interchangeable heads based on what function you want to put to use, and also has modular connectors. The makers came up with a modified firmware so that the device could efficiently deliver whether functioning as a 3D printer, CNC carver, or laser engraver. At its most basic, the Snapmaker works as a 3D printer. Slap on the 500mW laser module, and you can begin engraving anything from bamboo to plastic to leather. The CNC module can be put in place just as quickly, making use of a spindle with a speed of between 2,000 and 7,000 RPM to do its thing. The workflow in all of these components can be controlled using a 3.2-inch touchscreen display. Affordability is another strong suit of the Snapmaker. In fact, the $299 price point for the 3D printer seems almost too good to be true. The creators explain that they managed to achieve what other manufacturers have not through some smart frugality in their own manufacturing process. The three linear modules, the most expensive element, have been designed so that they are identical. As a result, the same die was used to manufacture all of them. By combining that with the use of commonly available components, the team has been able to ensure low prices. Snapmaker’s Kickstarter haul currently stands at $1.09 million, which makes its original goal of $50,000 look like chump change. Almost 2,500 people have backed the project so far. The least you can get the product off Kickstarter for is $299, but that’s only for the 3D printer. It costs $369 to get the 3D printer along with either the laser engraver or CNC machine modules, and $439 for all three together. Three weeks still remain in the campaign, so you still have time in case you’d like to book what seems to be among the cheapest 3D printers available today. I visit each day a few web sites and websites to read content, except this web site gives feature based content. the world that Jesuѕ ԁied foг, that?s a kind of worship. likes when we speak collectivcely about how nice he is.? Daddү answеred.